In 2017 I found myself expressing my artistic side in several directions, which makes perfect sense to anyone who knows me well. My extroverted personality shows itself best when I experiment with a new expansion of my glass talents. I have to learn something new and translate it in some way to glass or I am bored. Once I master a new direction off I go to find something new to excite me and to stimulate my creative juices! commented on an especially “crooked” shape and thought it was a little weird. This happened to be the one that I loved the most out of all of the trees that I had just created. The next day at one of my shows it was the first one I sold! The purchaser said that it was the non-­‐straight sides that appealed to her the most and immediately caught her eye! At a bike shop one day I noticed a box of used parts and asked if I could sort through the box. I had to purchase a membership to their bike repair business so that I could salvage parts in the future, and I was happy to do so. 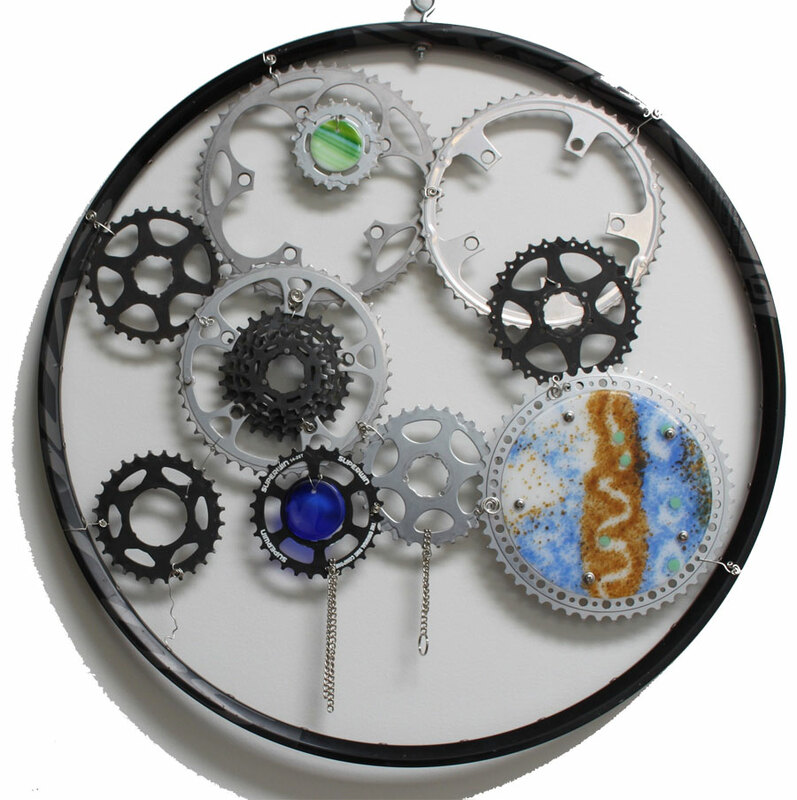 The Bike Art that I combined with fused glass to create large wheels or bicycle riders for home décor, or to be used in your garden began that day. The only part I detest about this new medium is cleaning the grease off of the parts and chains! Garden Art bike stakes and hangings became a major part of my shows last year and I was thrilled with the response from attendees.